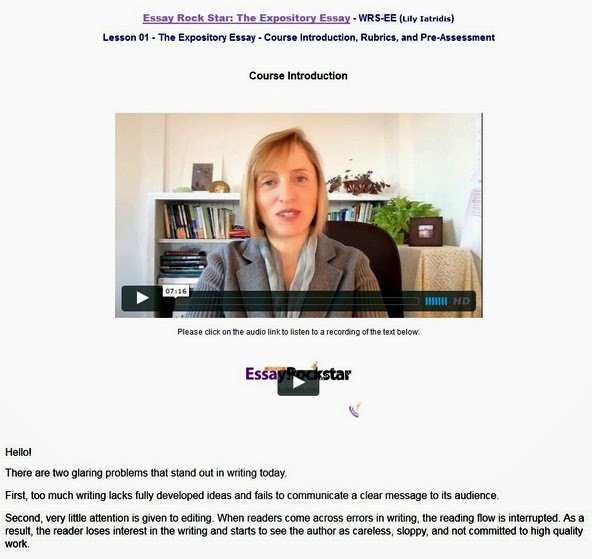 Adam and I were recently given the opportunity to review Essay Rock Star Expository Essay Writing Course by Fortuigence and jumped at the chance. I've mentioned quite a few times my desire for the kids to have a strong foundation in writing and all things Language Arts, and looked forward to Adam having a chance to work on his writing skills a bit more with a teacher who isn't Mama (because a different point of view can be a wonderful thing). Fortuigence offers a number of essay writing courses but I was drawn to the Expository Essay because it's the most common essay written in high school and college. The expository essay creates a well thought out, organized paper that explains, gives information, and informs - the ability to write one is a pretty important skill to have. I've taught all my kids how to write a good five-paragraph essay, but I want them to be able to leave that "five-paragraph box" when necessary, and my hope was that this Expository Essay course would help Adam with that. Essay Rock Star is an online homeschool writing course. Adam opens a lesson page where there is a short video produced by the teacher. He then can, and should, click on the links below the lesson, to gather more information. Once Adam has done the work asked of him for the lesson he uploads and submits it. The teacher, Ms. I (Ms. Lily Iatridis) then offers feedback and suggestions. Once the lesson is complete Adam is able to move on to the next lesson. The Expository Essay course contains seven lessons. Originally we'd planned to do two or more per week, but as Adam moved through the lessons we found ourselves on a more realistic pace of one to two lessons per week. The lessons only take about 20 minutes to go through, but the "home work" involved takes another 20-60 minutes (writing an essay takes time), then we had to wait for feedback via e-mail, which always arrived very quickly, once feedback was received Adam often had a little editing and fine tuning to do before resubmitting, then we again waited for feedback or approval to move on to the next lesson. Working continuously in the program Adam completed an average of 1.5 lessons per week. The lessons themselves were very informative and the feedback positive and helpful. After Lesson 2: I think you’ve got plenty of ideas for content for your expository essay on sailing. I look forward to learning more about it! Please move on to the next lesson in your online classroom whenever you’re ready. Lesson 3: I need to see what supporting details you'll have for those main ideas before I’ll be to give you proper feedback. Right now I think they may be too specific and therefore too brief as main ideas for essay content, but I won’t be sure until I see the rest of your work for this assignment. Lesson 3, round 2: Now that is what I’m talking about! The second outline you sent today is exactly what I was hoping to see from you. Now, when you go back to rewrite your free draft, all the things you want to talk about will be listed right there on your outline, and you don’t have to try to think up ideas while you free write. The ideas are already there, and all you have to do is explain them and share your feelings about them. Lesson 6: I know I told you to make the subheadings into complete sentences that went with the paragraph too (which you did nicely by the way), but I’d like you to make the edits requested in Lesson 6 too. Was that lesson too long for you? You can listen to the audio and work on it one part at a time. It’s important that you learn to be as independent as possible in your writing. to do, which I appreciated, but also gently guided him in the right direction, which was necessary. Adam felt he got a lot out of this course. He was thrilled to get a certificate of completion at the end and to know he earned .125 high school credits for taking and passing the course. * there wasn't enough detail on the lesson pages about what I was supposed to do for "homework"
Overall, both Adam and I were very happy with this course and I felt it accomplish the goal of teaching him how to write a solid expository essay. Essay Rock Star Expository Essay Writing Course, and three other essay writing courses, are available at Fortuigence for $57 and are geared toward students ages 12-18.